For a pump that handles mud, leaves, sand, and any solid up to 1.5″ without clogging, get the SludgeMaster™ high-flow air-driven submersible pump. This trash pump operates at up to 300 gpm – our highest flow rate- runs on compressed air for continuous power supply. 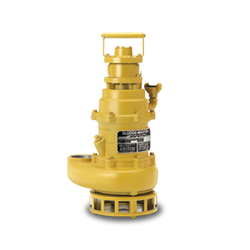 Weighing just 59 lbs, the SludgeMaster high-flow air-driven submersible pump is constructed for rough handling and long life on land, sea, or offshore. The SludgeMaster™ high-flow air-driven submersible pump.